It might still be hot out, but when it comes to beer we're already thinking about fall. Well, it’s the first week of September. That time of the year when the leaves start to change colour, people start getting ready to go back to school and, in my case, when I ready my horror movie playlist, bust out my scarves, and start the day by saying “Pumpkin spice EVERYTHING”. It’s the part of autumn that most people love or hate with very little in-between, but you can’t deny that pumpkin spiced items are incredibly popular. 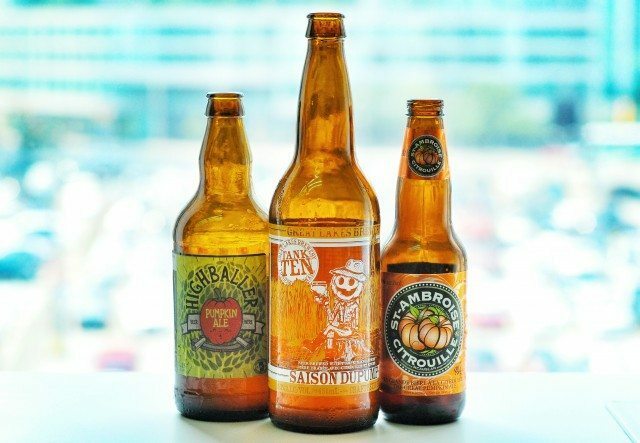 In the case of pumpkin beers, there has been so high a demand that breweries have been forced to start making the stuff even earlier (hence why you might have seen pumpkin beers in stores as early as last month). The beers in this style go from the fairly balanced to the horrifically overdone. Some beers you can practically hear the manic laughter of the brewer as they dump a burlap sack full of nutmeg in as you drink it. Personally, when it comes to pumpkin spice food and drink I’m not a fan of the huge flavour bombs. I don’t want to spend my favourite season of the year dry-heaving because some chef/brewer/barista decided that they loved pumpkin spice a little too much. I tend to opt for the more subtly flavoured items so my autumn cheer gradually blooms rather than punches my taste buds in the face while shouting. McAuslan St. Ambroise Pumpkin Ale – at 5% ABV and available in four packs at $9.95, St. Ambroise Pumpkin Ale by Quebec’s McAuslan Brewing is by far the best option for people new to the style and does a wonderful job of opting for balance of flavours instead of just pouring in the nutmeg. It’s got a very strong aroma of pumpkin spice, but don’t let it fool you. The taste itself is a touch sweet, but nicely balanced with a medium body. It’s not the explosive spicebomb of pumpkin pie filling, but it will get you craving a slice for sure. Great Lakes Brewery Saison DuPump – Of the pumpkin beers this one is perhaps the least offensive on the senses and the most surprising. Capped at 5.2% ABV, Great Lakes Saison DuPump has a very subtle hint of nutmeg and cinnamon, making way for a super clean finish and a slight bitter kick at the end. You’ll want to drink this one nice and cold for a rather refreshing seasonal experience. Available in 650ml bottles for $5.95. Grand River Highballer – For a nice sweet and creamy pumpkin beer, Grand River Brewing’s Highballer definitely does the job. Very subtle spice in the taste, but has plenty of vanilla, honey, and pure pumpkin notes that make this a wonderful little autumn sipper. If pumpkin spice just isn’t your bag, don’t worry. There are other beers out there that can help you get into the autumnal spirit. This year’s batch of Amsterdam Brewery’s Autumn Hop is fantastic. Using freshly picked cascade hops grown right here in Ontario, this is a beautifully bright and fresh tasting beer. At 5.6% ABV and $4.95 for a 500ml bottle, it’ll be a welcome addition to the season. Additionally, Muskoka Brewery’s Harvest Ale is back this year, but now in handy dandy six packs for $14.50 instead of the giant 750ml corked bottle. At 7% ABV, the beer possesses a nice warm bitter note that isn’t too overstated, this beer brings to mind light sweaters, orange and red leaves, and a slight chill to the air.